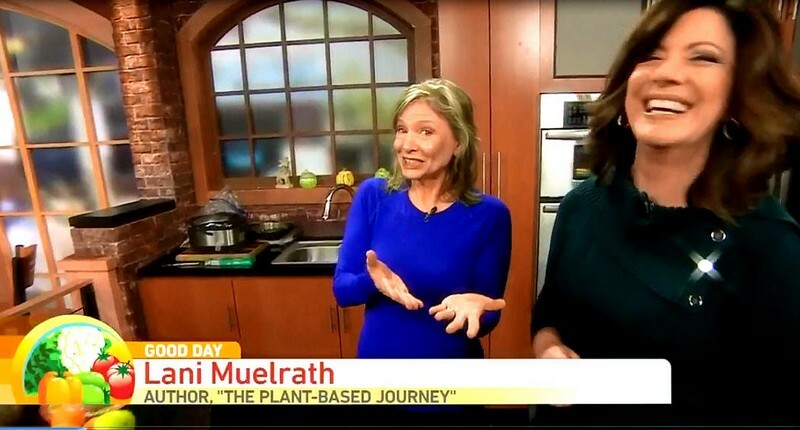 In this six minute segment, filmed live during CBS TV Good Day Sacramento, find out how to make robust, savory and filling plant-based eats that will have you exclaiming “I can’t believe it’s vegan!” Double click on the video image below to watch. 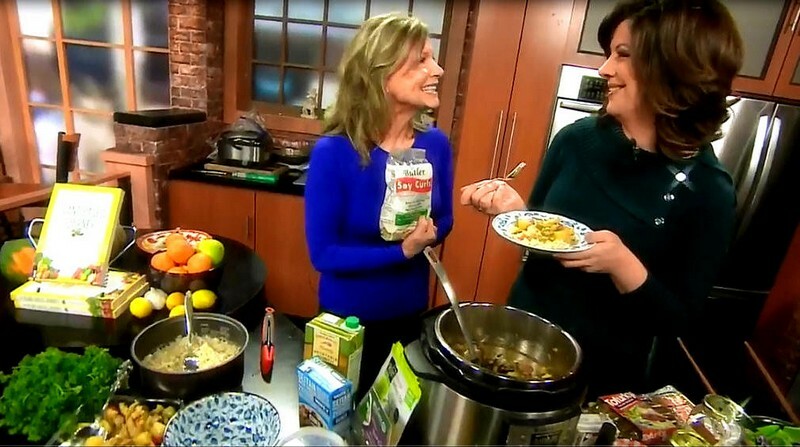 Cheers to Marianne and the team at CBS Good Day Sacramento for their enthusiasm and generosity with this segment! 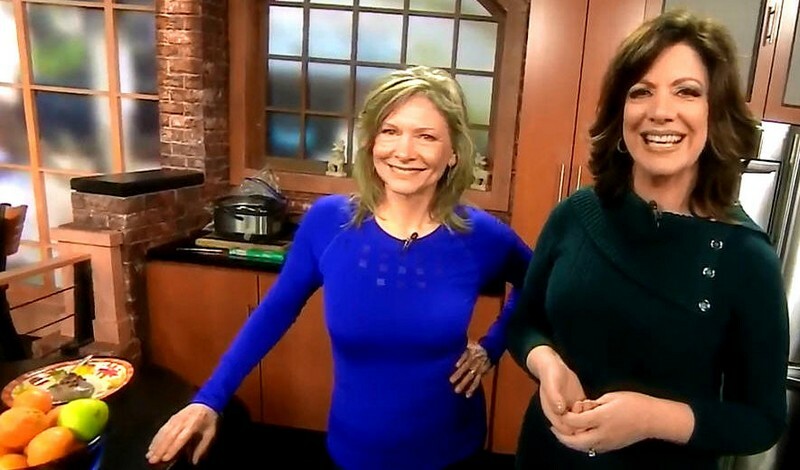 Recently, if you’ll recall, I dropped in CBS TV’s Good Day Sacramento, to demonstrate Fast Ways to Plantify Your Meaty Plate. This time we turn the tables a little bit and I show how to ‘meatify’ your planty plate – with all plant foods! There were some interesting developments in the show. Now, I have a thread of emails with clear instructions for an 8:45 airing and had posted that all over social media so people could tune in live. But I’ve been around television studios long enough to know that when it comes to TV, anything is possible and things can go wildly crazy with scheduling at any time! But I knew that being set up, unboxing my items, reheating things and all that was necessary – even if I took a lot of short cuts by leaving things out – that this ship would not be ready to sail by 8:15. At the same time, I know the pressures these studio teams deal with and wanted to pitch in an any way I could….so, I set up like lightening, didn’t get everything heated (and warned my cohost Marianne that the marinara sauce wasn’t going to be hot!) and we went LIVE fifteen minutes early at 8:30. Fun! After we were done, Marianne pulled together several bowls of food for her breakfast – she put mushroom meatballs in a bowl of stew, had more rice and sweet sour soy curls – and of course Chocolate Mousse Pie! The entire studio – and hits huge – was filled with the heady aroma of the stew and the brown jasmine rice. All in all a roaring success. But you tell me – can’t wait to hear your thoughts on this segment! More and more people these days are going plant-based and looking for vegan alternatives for their meals. Yet some people are are looking for their favorite ‘meaty’ flavors in their food. 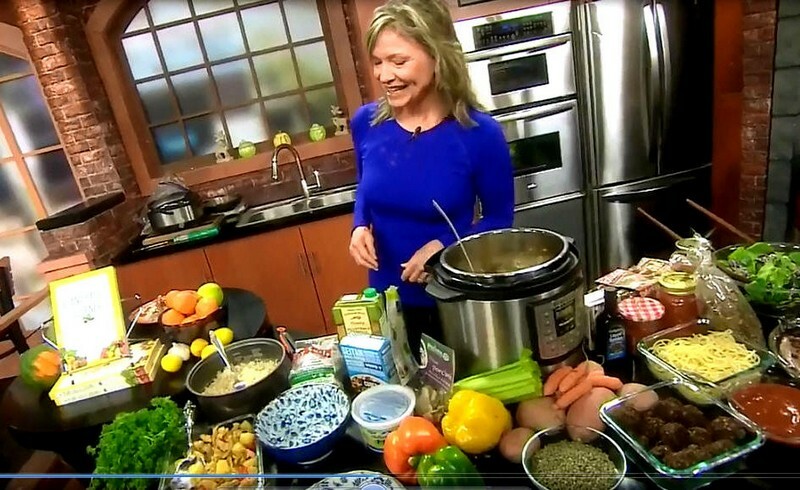 Video and recipe for making Vegan Beefless Stew you’ll find below and at Jill Ann McKeever’s ever charming and super-informative Simple Daily Recipes blog. Thank you Jill for sharing this spectacular recipe and video instructional! 1/2 teaspoon each salt & pepper Put all ingredients in a slow cooker and cook for three hours, or pressure cook in four minutes. Lani, this is such a great bit! You made it all look so easy and entertaining. So fun and the colors really catch the eye. The dishes all look deelish – thanks for posting the stew recipe I am going to have to try it! Julieanna, so great to see you drop by and leave your note. Thank you! Great job Lani! Hope it will inspire some people to try the recipes. Thanks you Jessica! My thoughts exactly. Thank you for sharing your thoughts, I so appreciate! You are so amazing! 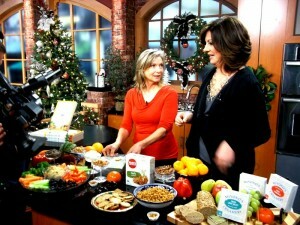 You got so much information into a few minutes and the variety in the colorful spread looks so fabulous and delicious! My mouth was watering 😉 I will try the recipes this weekend for sure! Hi Edith, oh thanks so much for the feedback! I’m glad you liked the way it looks. There is so much more I wanted to say! It did fly by! Where can we find the recipe for the Mushroom Neatballs? The Mushroom Neatballs were a hit at the station – and on my dining table, too – so I can see why you are asking after the recipe! However, it is a recipe that I have in development for publication – Marianne was my public “test drive” (my husband is already crazy over them!) – and it passed. So down the road the recipe will be available. Stay close and we’ll get there! Where will the meatball recipe eventually be able to be found? Is the recipe for the sweet and sour soy chirs already published somewhere? Thanks for the stew recipe. Hi Linda! I’ll announce in newsletter as these things unfold. Have you tried the stew? It is soooo good! Stay close and talk soon – are you getting my newsletter? As for the Soy Curls, I found them in a local natural foods store, that were there upon customer request. You can find them online on Amazon under Butler Soy Curls, they come in bundles of 3 and 6, at the Butler Site . I’m making them tonight! Let me know if you get some, what you make with them, and how you likey! Is the recipe for the Sweet and Sour Soy Curls available somewhere? Hi Kim! Down the road it will be – don’t you love sweet sour? For now you could take your favorite sweet sour sauce and use it on the soy curls? 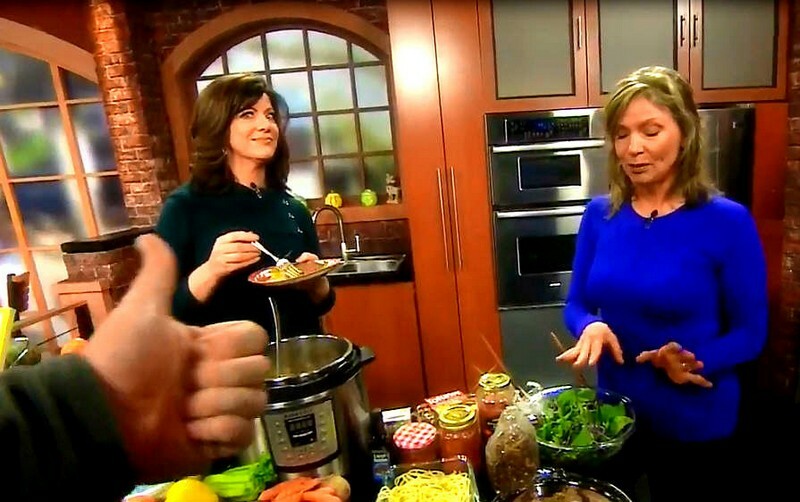 Lani: the “beef” stew looks wonderful, but ……. I’m a bit confused about using meat substitutes such as Gardein beefless tips. They are a highly processed food and have a lot of oil and salt.